For more than four decades outdoors enthusiasts from across southern Michigan have flocked to Outdoorama each year, making it one of the best and longest-running outdoors shows in the Midwest. With exciting entertainment, educational seminars and a huge display of boats and motors, hunting gear, fishing gear, hiking and camping accessories and more, this year's show is stacking up to be better than ever. 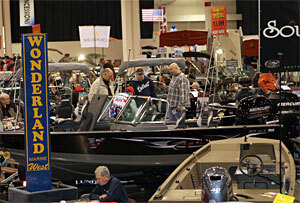 The 44th annual Outdoorama is Feb. 23 to 26 at Suburban Collection Showplace, 46100 Grand River Avenue in Novi. Hunters, anglers, hikers, bird watchers, campers, canoers and other outdoors enthusiasts will fill the aisles at Outdoorama looking for hot deals from hundreds of vendors on boats and sporting gear, for conservation education that includes nearly 100 free seminars, and for family entertainment and fun. Show patrons can expect to find great deals on fishing and hunting boats, pontoons, kayaks and pleasure boats, marine accessories, docks, lifts, hunting and fishing gear, and camping supplies. "Sportsmen and sportswomen from throughout Southern Michigan have continued to support Outdoorama, which is a testament to the deep outdoors traditions and conservation heritage," said Show Manager Ben Nielsen. "With over four acres of boats, hunting and fishing equipment, outfitters, conservation organizations and other features this year's show promises to keep those traditions alive." A new feature this year at Outdoorama is the Alaskan Timbermen Lumberjack Show. The Alaskan Timbermen Team will be battling it out in the Olympics of the Forest at this year's Outdoorama show. Two top Alaskan Lumberjacks will be going head to head in competitions that include Chopping, Sawing, Axe Throwing, Chain Sawing, Tree Climbing and Log Rolling. These rugged woodsmen are some of the world's best timber athletes and have been featured on the Outdoor Channel. When not cutting logs in competition you can find these men in the wilds hunting bear or mountain goats and catching halibut or king salmon on the ocean. The action and stories provided by these men will captivate the crowds on stage at Outdoorama. Demonstration always attract large crowds. 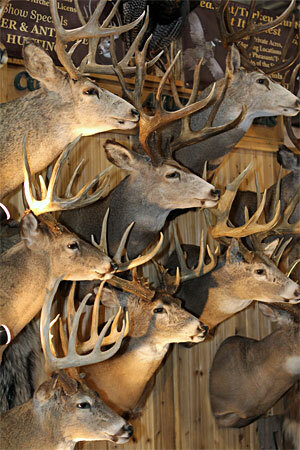 Outdoorama patrons may bring their deer, bear, elk and turkey trophies to the show and have them scored for free by Commemorative Bucks of Michigan. Once scored, the owners have the option of having their trophy displayed for the duration of the show on the Outdoorama Buck Boards. Adding to the show's broad appeal is the 11th Annual Cottage & Lakefront Living Show, which runs concurrently at Suburban Collection Showplace. Patrons to either event receive free crossover admission. For those interested in booking an out-of-town adventure, Outdoorama features dozens of lodges, outfitters, guides and charter boat captains from Alaska to Africa and across North America. Other fun activities featured at Outdoorama include a Trout Pond stocked with rainbow trout, a Video Fishing Simulator, an Archery Range for kids and newcomers, a Pellet Shooting Range, Fly Tiers Corner and the Sportsman's Grill with fresh Bar-B-Que Sandwiches. Dozens of sport clubs and conservation organizations, many of which are Michigan United Conservation Clubs affiliates, will staff booths with volunteers to hand out literature and explain club programs. Birds of prey and other animals and birds native to Michigan will be on display by the Howell Nature Center and the Michigan Hawking Club. Tom Richardson and Jason Herbert will be presenting seminars on different aspects of deer hunting including calling deer and "hunting on a dime." Also scheduled to appear are Steve Francis, owner of Country Smokehouse with a deer processing demonstration; national turkey hunting authorities Greg Abbas and Seth McCullough; dog trainer Len Jenkins; land management expert Tony LaPratt; and food plot specialist Ed Spinazzola. Walleye experts Mark Romanack, Mark Martin, Lance Valentine and Jake Romanack headline the Fishing Academy of veteran speakers that also includes bass pro Wayne Carpenter, multi-species expert on Lake St. Clair Joel Piatek, and full-time muskie guides Mike Pittiglio and Kevin Backus. The show that celebrates Michigan's great outdoors is February 23 to 26. Bring the kids and grandchildren. NEW show hours are Thursday, 1 to 9; Friday, 11 to 9:30; Saturday, 10 to 9; and Sunday, 10 to 5. For more information, go to http://www.Outdoorama.com or call 800-328-6550. Discount tickets are available at Wendy's or online at Outdoorama.com. You can also follow late-breaking news and developments at: www.facebook.com/ULTIMATESPORTSHOWTOUR and at www.twitter.com/Outdoorama.